Castle, coat of arms, crenellation, crest, education, Latin, Launceston, Launceston Church Grammar School, Mowbray, parapet, school, sculpture, shield, Tas, Tasmania, tower. Launceston Church Grammar School has two campuses in the northern Tasmanian city of Launceston. 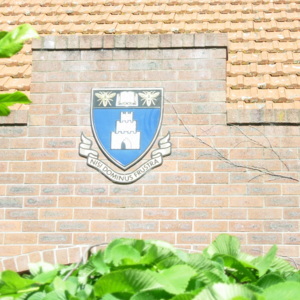 The school crest, or coat of arms, features a shield with the image of a castle with crenelated parapets and square towers. Above the castle is an open book and two bees. Below the shield is a Latin tag which reads ‘Unless the Lord is with us, our labour is in vain’. Featured is an ornate sculptured crest and a more recent simplified version. These photographs were taken on the Mowbray campus. 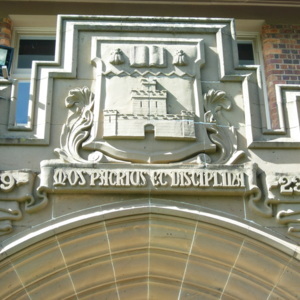 “Launceston Church Grammar School crest, Mowbray, Launceston, Tasmania,” Medievalism in Australian Cultural Memory, accessed April 23, 2019, http://ausmed.arts.uwa.edu.au/items/show/1234.